We would like to wish a very happy Mardis Gras to our three recommended properties in New Orleans: the historic Soniat House, the contemporary International House* and the stately Windsor Court Hotel. 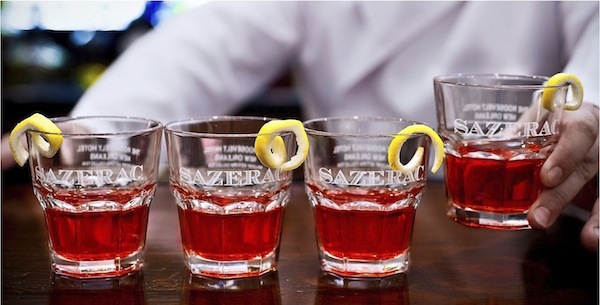 And for anyone celebrating Fat Tuesday this evening, we recommend a nightcap at the Sazerac Bar. Although the Sazerac is the signature cocktail of New Orleans, its origins remain obscure. It is widely held that an extremely similar drink was served at a “coffee house” called the Sazerac House in the late 1800s. This became known as the Sazerac Bar, which then moved to the Roosevelt Hotel in 1949. The hotel went into decline in the latter part of the 20th century, but was brought back to life last year after a $145 million restoration by Waldorf Astoria. The Sazerac Bar was one of the most anticipated parts of the project, and this splendid art deco room now has a counter of polished African walnut and walls graced with 1930s Paul Ninas murals of New Orleans street life. We recently squeezed into a banquette with some friends for a round of Sazeracs — a mix of rye whiskey, Peychaud’s Bitters and Herbsaint — before dinner one night and enjoyed ourselves so much we felt obliged to return the next evening!